PROSPECT – The Region 16 Board of Education lobbed off another three percent from the increase on its proposed budget and is set to bring it to the people. 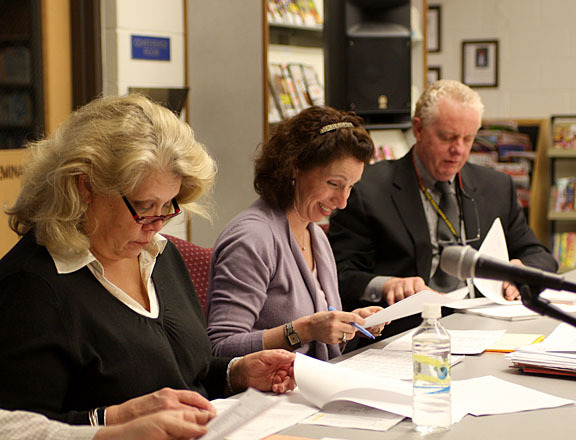 The board voted Tuesday night to present a $36.9 million budget to the public at a hearing scheduled for April 13 at 7:15 p.m. at Woodland Regional High School. The total increase would be about $260,000 over last year’s budget. The board went into Tuesday’s meeting with a $295,000, or 0.8 percent, increase but that figure went down after a decision to cut culinary electives from freshmen’s arsenal of choices. Students would still be able to take culinary classes starting in their sophomore year. Priscilla Cretella, vice chair of the board, pushed for the reduction in non-progressive electives, something she said the board has looked at doing for the past three years. Many students take culinary their freshman year, but don’t move forward with the subject in proceeding years. Superintendent of Schools James Agostine pointed out that if you take away some elective courses, it forces kids into others. “It’s like a water balloon. If your pool of elective choices is there, and you push in on one side, it bulges on the other side,” he said. School Board Chair Lisa DeGoes said the move would force students into more progressive electives, giving them fewer, but better choices. Agostine said the high school’s broad spectrum of electives allows students to dabble, helping them decide where to head for post-secondary education after graduation. “That may light a fire for them,” Agostine said. The board voted to cut two or three sections of freshmen culinary, reducing culinary arts by five-tenths. Board member Robert Hiscox was the only dissenting vote, saying the board should have informed students of the change before they chose their electives this year. Freshmen who chose culinary as a first choice elective will be put in one of their other choices instead. Agostine said staff cuts and retirement incentives offset increases in medical insurance, contractual obligations, fuel and transportation, among others. “We worked hard to get this to this level,” Agostine said. The board replaced a high school guidance councilor with a half time career councilor, and refilled a full-time science position with a half-time position. The board has not had to lay off any teachers. “We think it’s reasonable with our population decline to do that,” Agostine said. He said he was pleased with the less than one percent increase. “I was hoping this year that we could’ve got it to a zero percent budget. We took out a lot of things. … Going much more in terms of chiseling away at budget items, you’re really at the threshold where you talk programmatically if it’s the board’s desire to go any further,” Agostine said. Several board members pointed out that this year, they were able to spend less than their budgeted amount and returned $839,000 to the towns of Prospect and Beacon Falls. Agostine said he was worried, with the budget stripped down so far, that the school board may not be able to return excess funds in the future, which could affect their bond rating. “When the public approves a referendum for our budget, the district is entitled to spend that money down to zero. That is not a habit that Region 16 has ever done. … It’s with some caution that I present this budget to you tonight because I believe in my heart of hearts that this 0.8 is very frugal. It’s very tight. We will have to be extra wary as we go through the school year next year to make sure that we spend these funds wisely. I’m fearful that if we go much deeper than this, that we could end up in that bad place,” Agostine said.